Posted on February 4, 2017 by Karatzas Marine Advisors & Co. 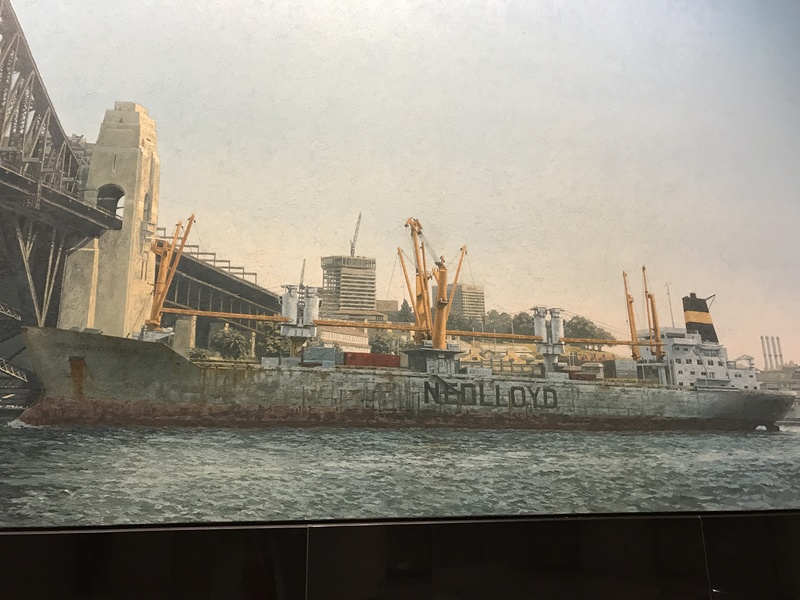 Fascinating detail of Nedlloyd three-island-arrangement vessel from painting ‘Sydney, December, Midday’ by Craig McPherson, 1990. Oil on linen. In the lobby of the American Express Building (Three World Financial Center) in Downtown Manhattan. Part of our daily commuting to Karatzas Marine Advisors offices at One World Financial Center next door. Image credit: Karatzas Images. And if one believes that shipping is uncorrelated to politics, that’s a clear misconception. The most innocent of political stories that we could put on our blog these days! And, a nice story about the Chinese New Year; one may wonder why such a story appears on a shipping blog, but again, please bear in mind that China is responsible for 15% of worldwide imports and 20% of worldwide exports. They matter for shipping and knowing a bit about Chinese culture and history and tradition is good for culture and good for business, we would opine. Gong Xi Fa Cai!